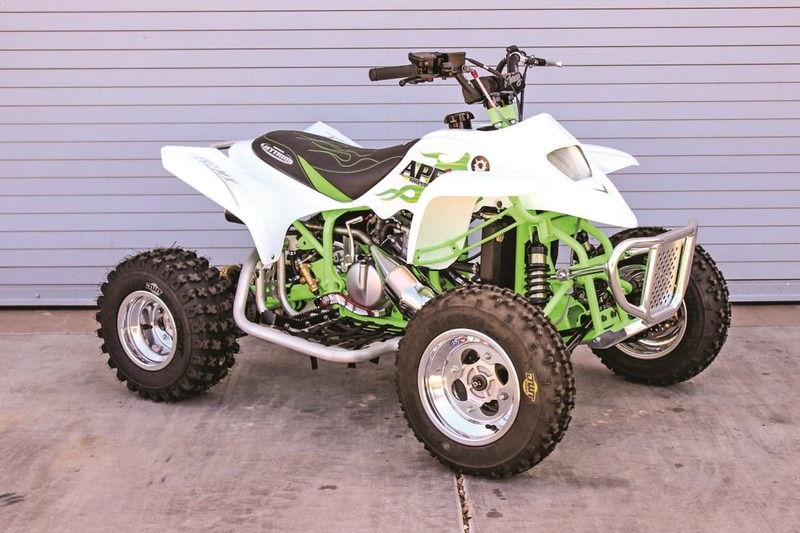 Apex designs sport- and racing-style ATVs for our youth. This lineup of mini quads is built with racing style components like adjustable suspension, nerf bars and more. If you want to get your child into racing track, woods or desert, the Apex lineup is a great place to start. Claimed wet weight 248 lb. Can-Am’s DS 70 is their entry-level youth machine. It sports a single-cylinder, four-stroke engine that is paired with a fully automatic CV style transmission. The hand controls are small to accept usage by little hands. The DS is started either electronically or via backup a foot operated kick-starter. Claimed wet weight 250 lb. The DS 90 is the bigger sibling in power output but utilizes the same handling as the 70. An automatic CV transmission is joined to the engine, and there is a parental-controlled throttle limiter. Single-A-arm-type front suspension has 3.4 inches of travel, while a swingarm rear suspension provides 6.3 inches of travel. Claimed wet weight 245 lb. The best childhood riding memories could be made on a Can-Am DS 90 X. 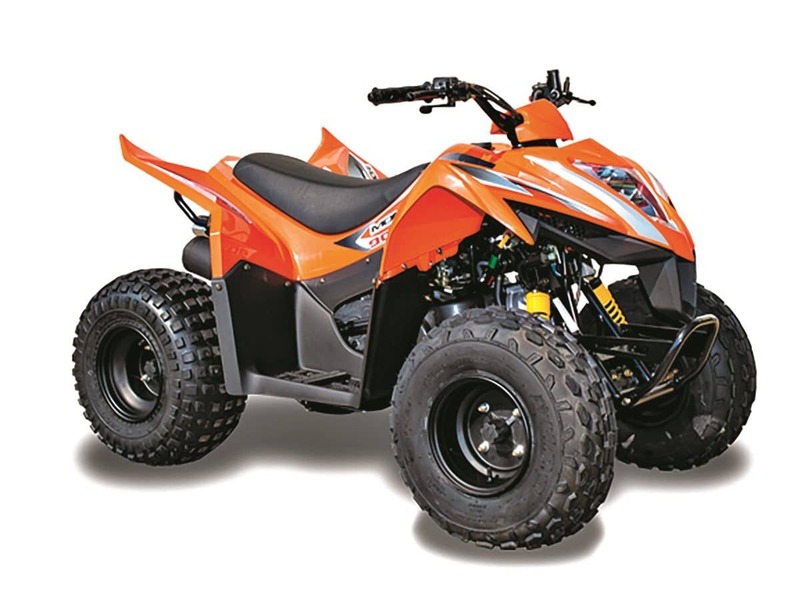 This little ATV is sport-oriented with a wide footprint, nerf bars and a front bumper as standard features. The shocks are a piggyback reservoir type, with progressive rate springs to help provide a supple and smooth ride in the rough. 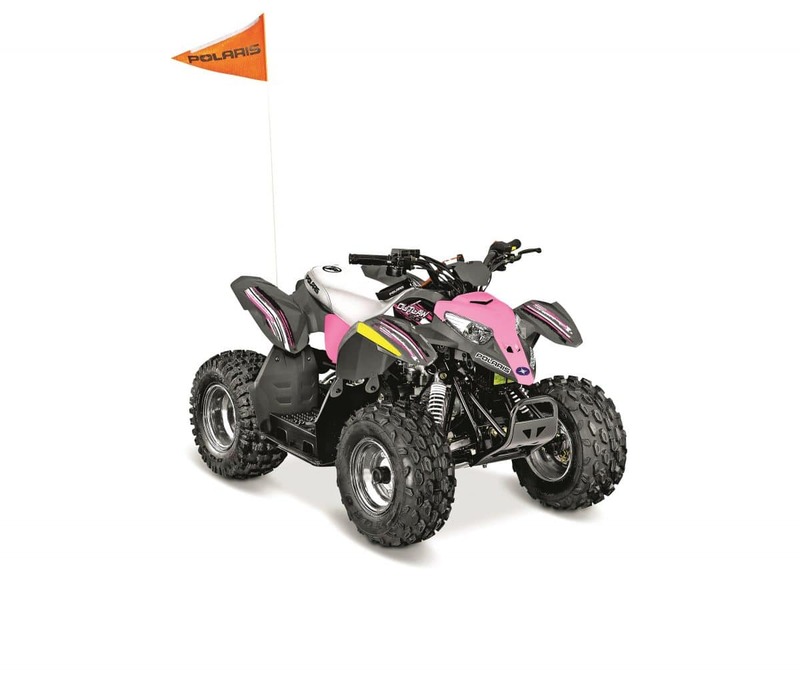 Your youth gets a choice of three colors for this sporty little ATV. White, red and blue are the options. The engine is a potent 108cc mill that is paired to an automatic CVT. Ventilated hydraulic disc brakes provide all the needed stopping power, and a 1.8- gallon fuel tank keeps your kid riding for hours. Claimed wet weight 375 lb. 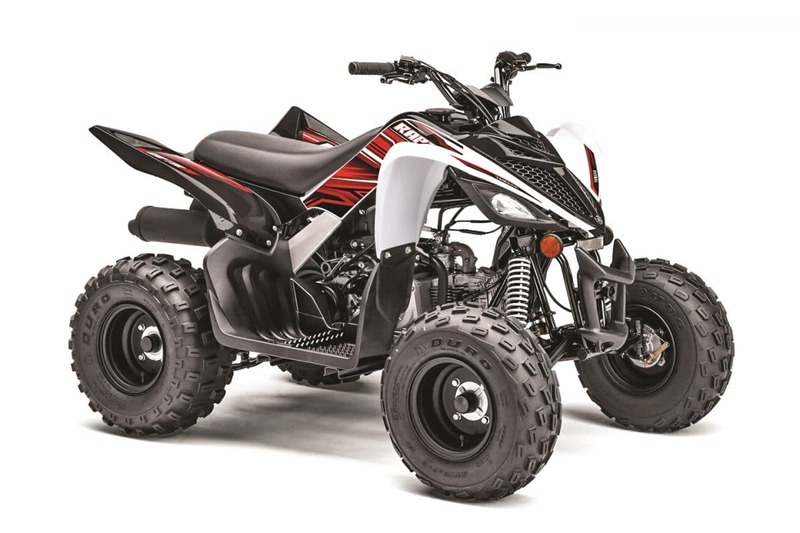 2019 brings no surprises to Honda’s youth ATV lineup. The sole machine remains as the great TRX90X. This machine comes with a manually shifted four-speed transmission that is paired to an electric-start, air-cooled four-stroke engine. White, red and green are the available color options for the Honda. Claimed wet weight 262 lb. 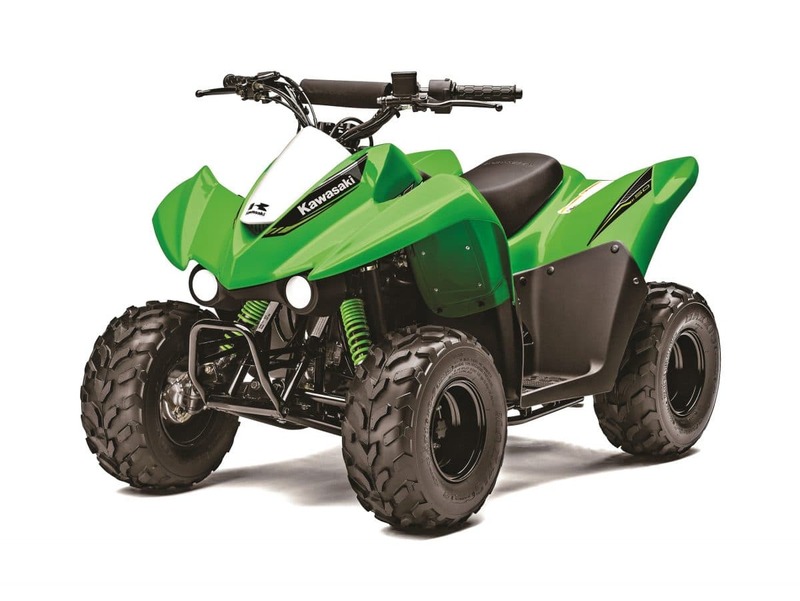 Kawasaki may have gotten rid of their 450, but our youth can enjoy their KFX50 still! The body and frame are sized just right for small riders. The hand controls are also designed for little paws. The engine is a soft 49cc four-stroke that is air-cooled and started electronically through a handlebar-mounted push button. Claimed wet weight 240 lb. This little ATV shares the same frame as the 50 model. However, it holds an 89cc, single-cylinder, four-stroke powerplant paired with an automatic CVT in its frame. It has a built-in throttle limiter and can be started electronically. The front suspension is a single-A-arm type, while the rear suspension is a swingarm and solid rear axle. Claimed wet weight 230 lb. 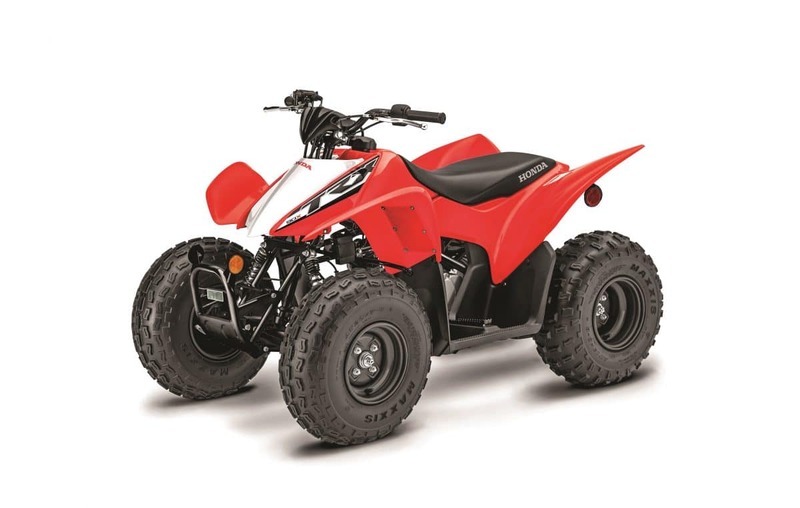 Kymco is a great way to go for your child’s first ATV. The Mongoose 70S is rated for little riders 6 years and up. It comes with an auto-stop safety lanyard and matte black sport-styled wheels. Color schemes for this 69cc, air-cooled four-stroke machine are orange or black. It is electric- or kick-started. Claimed wet weight 232 lb. The Mongoose 90S is rated for kids that are 10 years old and up. 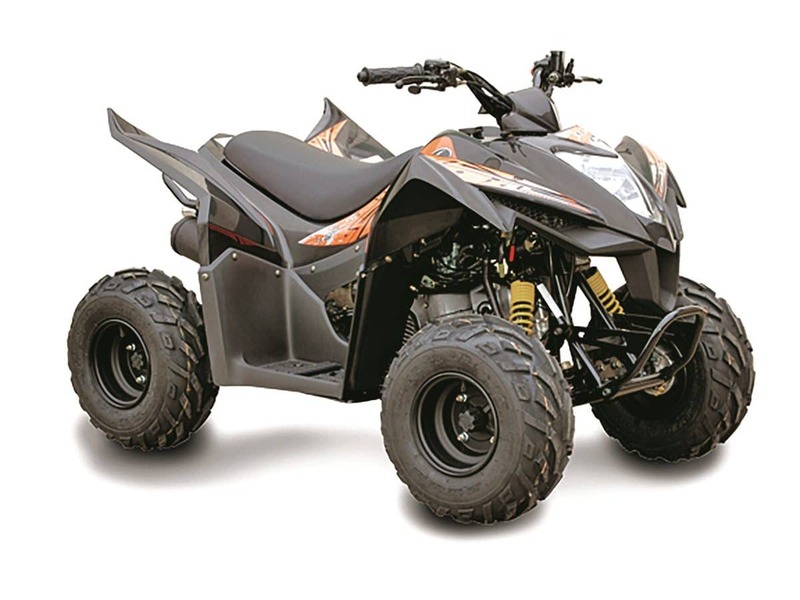 This ATV is electronically started and has an automatic CV transmission with forward, neutral and reverse. The suspension is a swingarm type in the rear and single A-arm up front with preload-adjustable shocks. 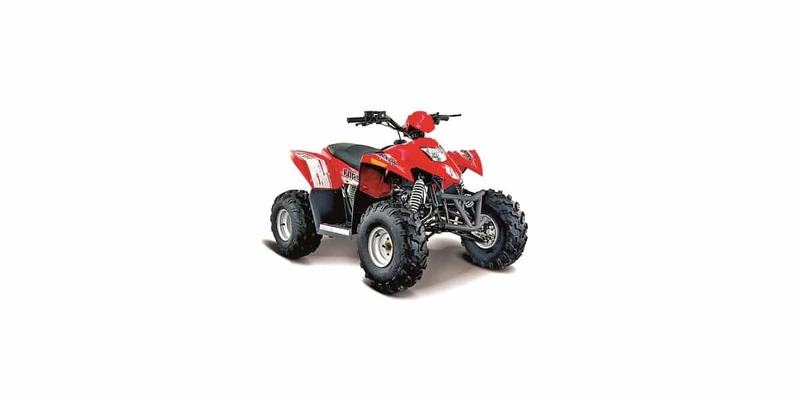 This sporty little starter quad carries a smooth 49cc four-stroke engine in its frame. Stopping power is produced by drum brakes in the front and rear. When you purchase an Outlaw 50, a safety flag, youth helmet, safety tether and a training DVD come with it. Claimed wet weight 215 lb. Riders who are 10 years of age or older can pilot this fuel-injected 112cc Outlaw. 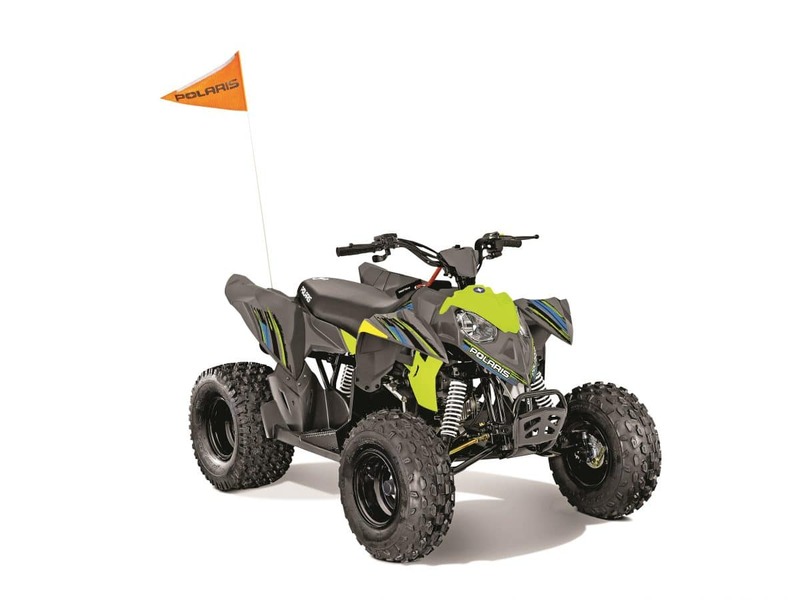 Single-A-arm suspension softens the ride up front, while a rear swingarm with 6 inches of suspension travel keeps the rear smooth. 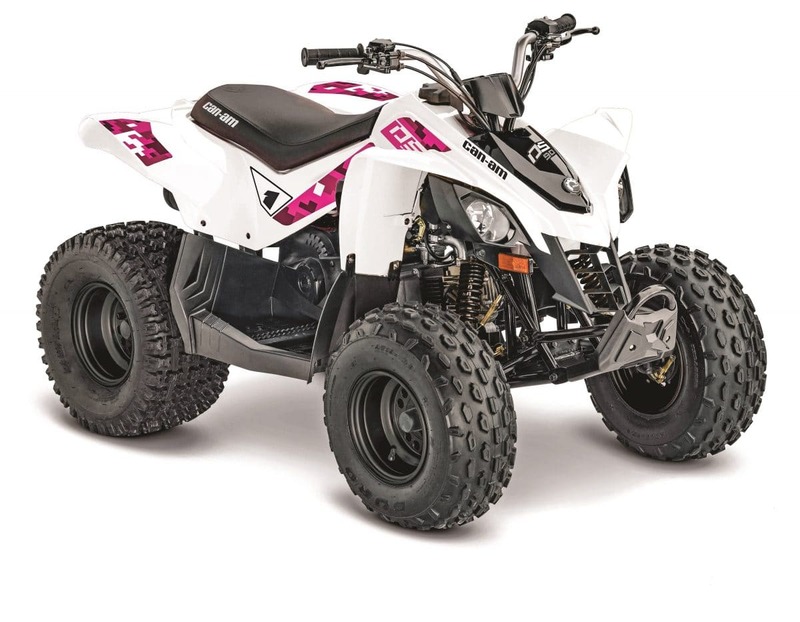 Polaris gave this machine either a high vis or pink and grey color scheme for 2019. Claimed wet weight 278 lb. 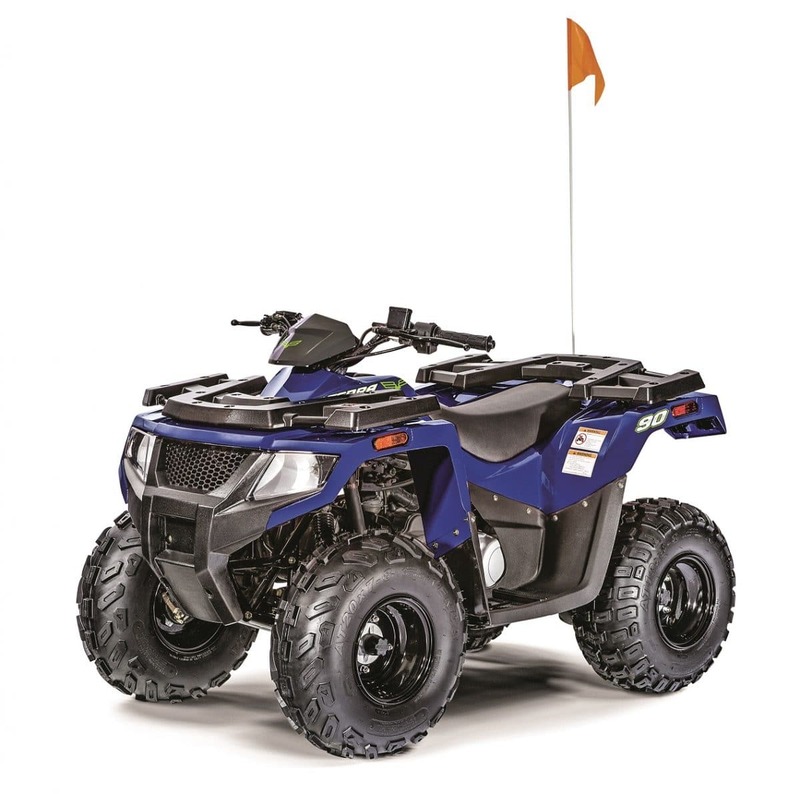 Polaris couldn’t let all the sport quad riders have all the fun, so they built the Sportsman 110 that resembles the larger utility quads in their lineup. It shares the same engine and frame size as the Outlaw, including the automatic CVT. The cargo racks are functional. Claimed wet weight 289 lb. 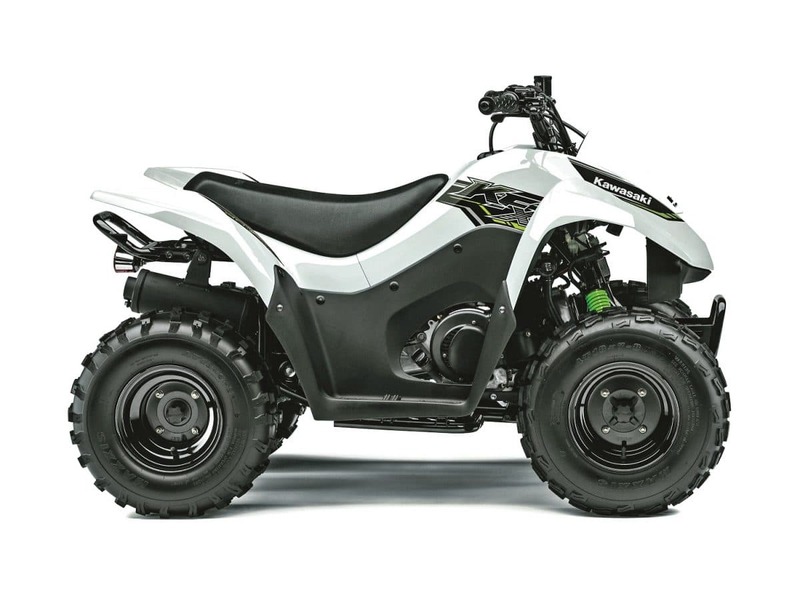 Suzuki’s entry-level youth quad is the QuadSport Z50 for riders ages 6 and older. The engine is a carbureted, 49cc, air-cooled single-cylinder mated to a CVT. 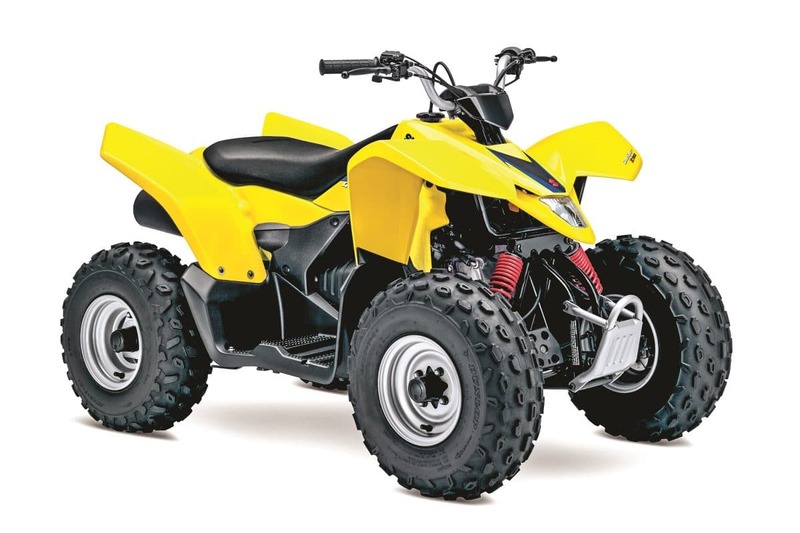 The front suspension is a single-A-arm type, while the rear utilizes a solid-axle swingarm. The brakes are drum style all around. Claimed wet weight 174 lb. Next up in the youth lineup for Suzuki is the Z90. The old LT80 was one of the best youth quads around, and Suzuki continued the spirit with the four-stroke 90cc machine. The transmission is an automatic CV. Drum brakes slow it down, and it has an adjustable throttle limiter. Claimed wet weight 280 lb. Textron followed in similar footsteps as Polaris with their youth models. The DVX 90 is a sport quad-inspired mini with a 49cc air-cooled engine. The transmission is automatic, and there is a throttle limiter built in. They also built a utility-style version that maintains similar attributes to the DVX. Claimed wet weight 260 lb. The Alterra 90 utilizes the same engine, transmission and a similar frame that the DVX utilizes. 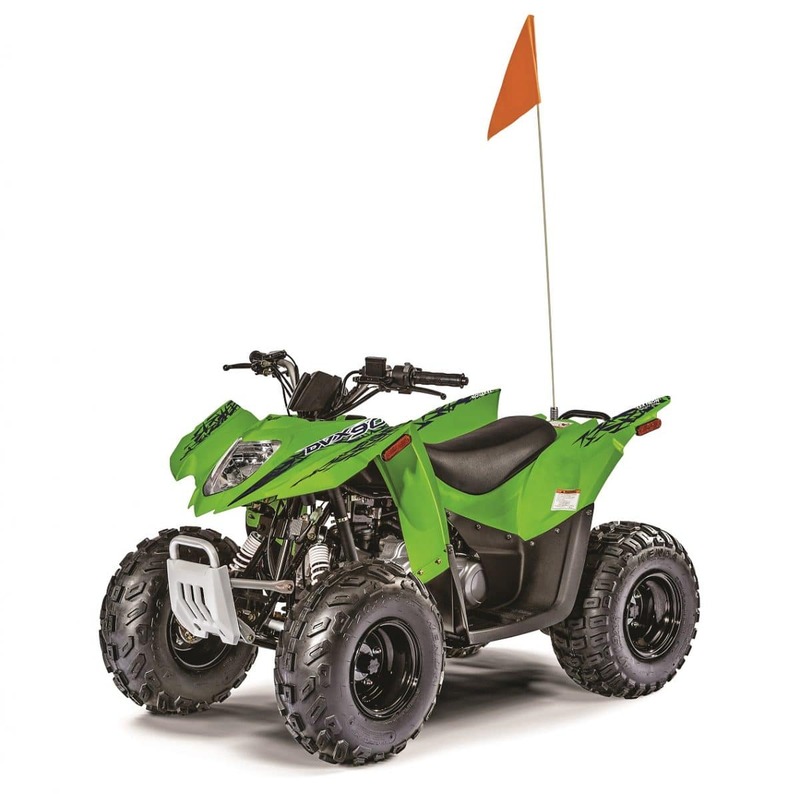 This little recreational utility-style ATV comes with a front and rear cargo rack and looks just like its parents in the full-size Alterra line. The suspension is independent up front and swingarm in the rear. The YFZ50 will make any little kid feel like they are riding dad’s big 450. 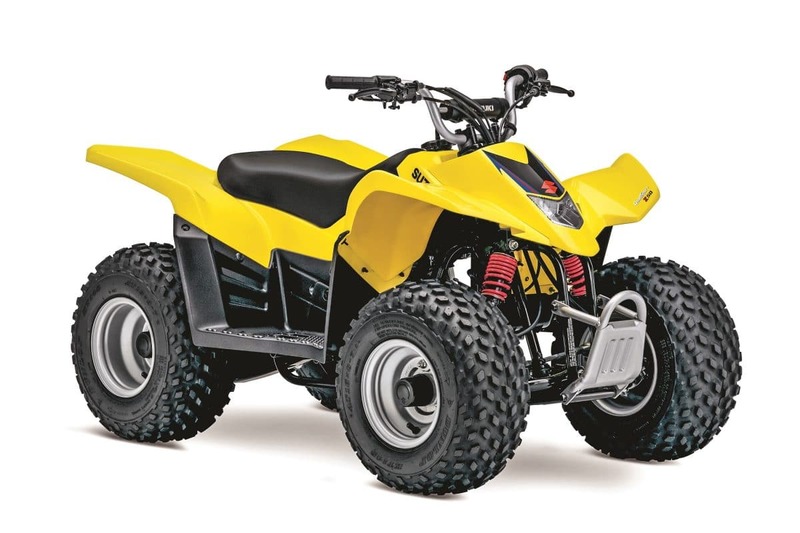 This starter model comes with a 49cc, air-cooled, single-cylinder four-stroke engine. All the controls are suited for kids 6 years old and up. 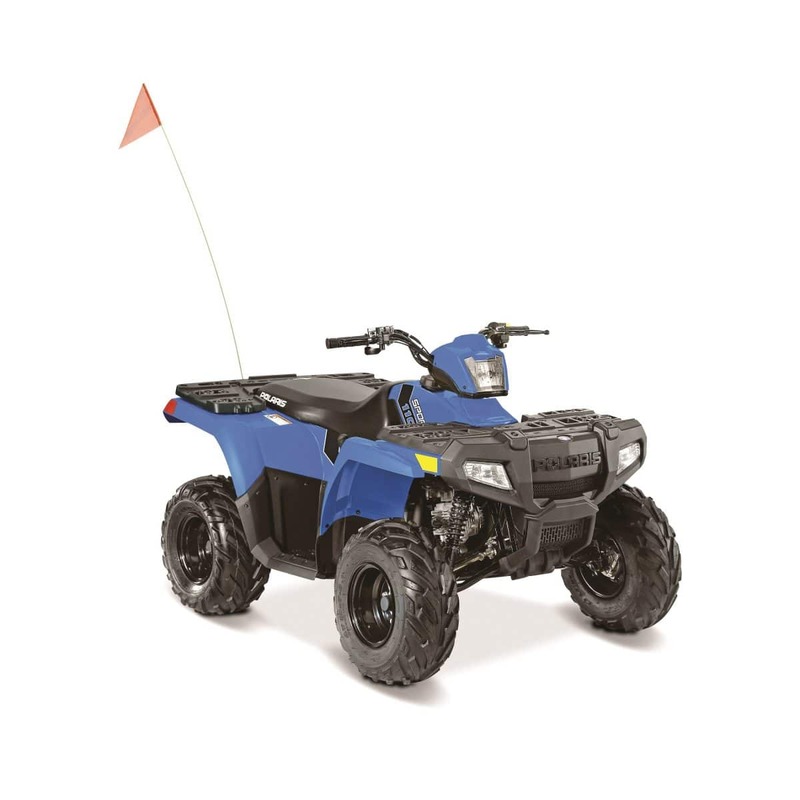 Parents can limit the throttle usage, and a 1.5-gallon tank keeps your kids entertained for hours. Claimed wet weight 220 lb. 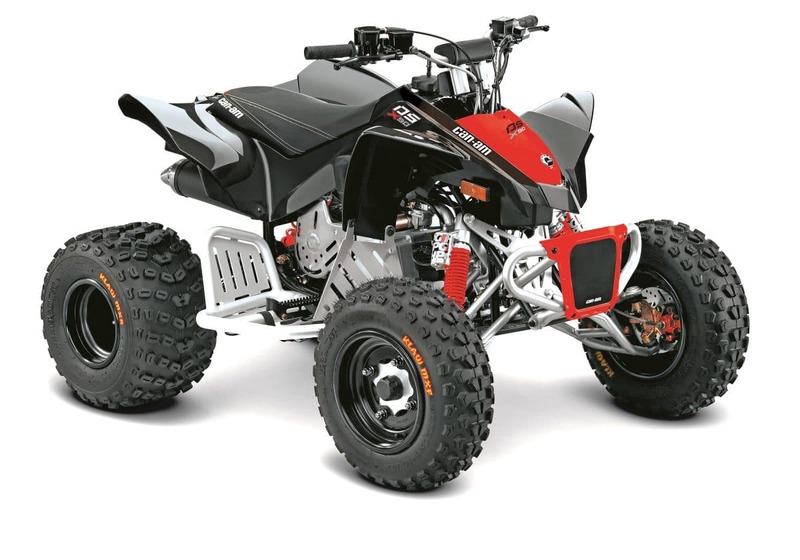 This youth quad takes DNA from the big-bore Raptor 700. 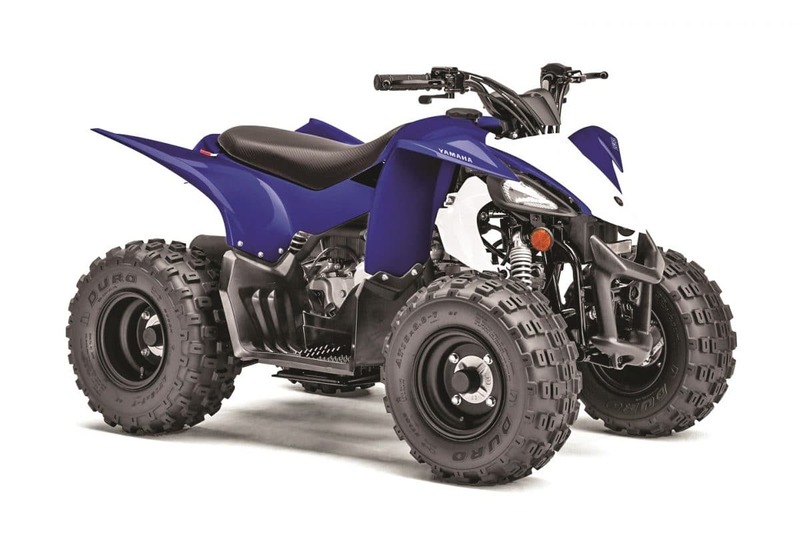 The Raptor 90 uses a 90cc, single-cylinder, four-stroke engine paired with an automatic CVT that is then chain-driven to the rear wheels. It is electric- or kick-started, and it comes in blue or white and pink for 2019. Claimed wet weight 279 lb.